Go Dok-Mi (in Korean, literally “lonely beauty”) is a shy, frugal freelance copy editor who, for a yet-to-be-revealed reason, refuses to leave her apartment or interact with people as much as possible. Every day, she anonymously receives a carton of milk with a post-it attached. Every day, using a pair of yellow binoculars, she steals peeks at her neighbour across the street, Han Tae-Joon, as he goes through his daily morning routine. The last time she was outside, in a park on an autumn day, she had fallen in love with Tae-Joon at first sight, following him and watching as he picked up a puppy in a box and took it home. When she looked out her window and saw him living in the apartment opposite hers, she thought of it as fate. Enrique Geum arrives in Seoul from Spain, his reason for coming is “cupid’s arrow.” Though he’s in love with his best friend Yoon Seo-Young, she has feelings instead for his older brother, Han Tae-Joon, so he intends to play cupid for the two. When Enrique comes to stay at Tae-Joon’s apartment, he catches Dok-Mi in the act. That same day, a new neighbour Watanabe Ryu moves into the apartment across to Dok-Mi’s (Jin-Rak lives next door). And with all these new men suddenly entering her life, Dok-Mi’s solitary and orderly world is turned upside down. I think Flower Boy Next Door is the most boring Korean drama that I have ever seen thus far. The story is pretty boring and the conflict didn’t catch my attention enough. I mostly watch it while doing other things, therefore, I don’t really pay too much attention to the series. Yep, it’s that boring alright. The only thing that I like about this series perhaps Park Shin-Hye’s character who is an editor. I myself also want to be an editor. It’s different as a writer, but I think being an editor is also good and exciting. Dealing with books is always an interesting job. As for the male characters, at first I like Jin-Rak, but then I prefer Enrique Geum. Although it’s not the like that I feel like towards Yoo Si-Jin in Descendants of the Sun (2016). It’s a different like and definitely only an average like. I don’t know why my sister like him very much. Speaking of her, this drama is a recommendation from her. Well, she didn’t actually recommend it because she already told me that the story is somehow not that good. But she said the main female character, which is Dok-Mi, is very similar to me. No way! I am not as closed as her. I mean, I can’t speak to strangers easily, but I am certainly not that afraid that I don’t dare to go out from the house. I am not afraid of other people that much. But I do like to spend my days at home just for writing, or in Dok-Mi’s case for editing. I guess we’re not the same. We’re not, Sis! But seriously, I have never watched a series and just not pay too much attention with it. Even when I felt bored watching Game of Thrones, I still know what happened in the series. But this one, well, hands up. I give up. Every time I start to watch it, I fell asleep. I even have missed out half of the episodes because I fell asleep. I think the problem is the conflict is not clear enough. I must ask my sister first about the conflict. When I found out, it’s pretty interesting, but somehow the execution is not really working. I think they can make it more intriguing, but unfortunately, they didn’t. And therefore, the story becomes really boring. Even though this series is pretty boring, I still will give credit to the main story line. It’s good but the execution isn’t, unfortunately. But I like the beginning of the episode in which Enrique wears his Panda suit. It’s really really funny. I even watched it a few times because it’s just too cute! His panda accessories are too cute to miss out! Seriously. 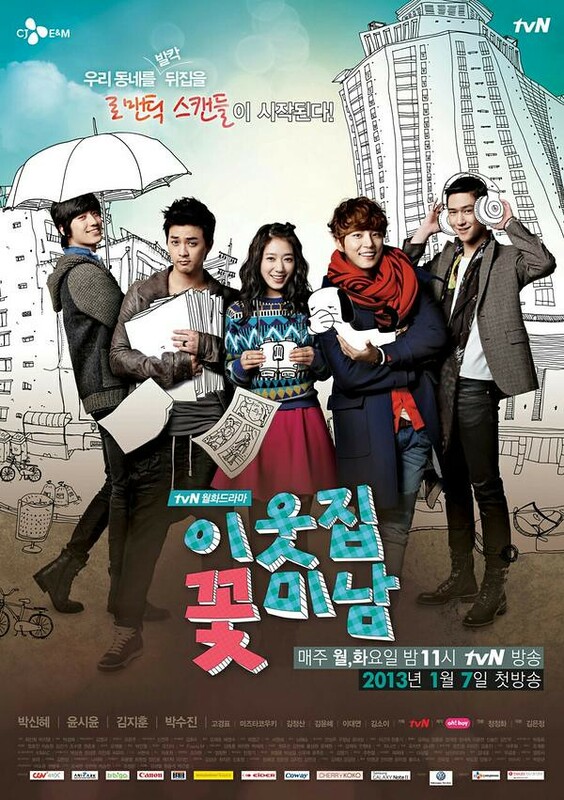 Flower Boy Next Door is not that bad, but it’s definitely not that good either. It’s mostly boring but I like the basic main storyline. It’s interesting but I think, they didn’t develop it good enough to make it caught my attention. After so many considerations, I give this Flower Boy Next Door 6 out 10 stars.